If you are one of the unfortunate many who can't keep chickens on your own either because they are illegal or you don't have room or you simply don't have the time, there's still a way for you to get your urban chicken on! 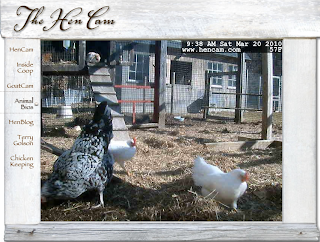 Enter The Hen Cam, an ingenious little website maintained by writer Terry Golson. In addition to Golson's well-written HenBlog, the site provides us a view into life with chickens and goats on Little Pond Farm (which is actually just her backyard in a town west of Boston, Massachusetts). She's got several cameras set up throughout her backyard taking pictures every 5 seconds and streaming them onto the web, allowing viewers to see snapshots from multiple viewpoints within the chicken's coop and run. And if, like me, you wonder how the whole thing works, there's a detailed page on how the camera setup is configured so you can get your geek on. If you look long enough (warning: it's mesmerizing), you can see all her birds: the Polish Cresteds, the Wyandotte, the Sussex, the Barred Rock (see her full list of animals here). What I love about the HenCam is its aquarium-like quality: you get to see chickens being very chicken-like without going outdoors or influencing their behavior by standing outside their run or having to scrape your feet! If you find yourself spending too much watching the Hen Cam, maybe it's a sign you need to get urban chickens of your own. We have chickens, 4 pekins and a polish crested and they are fun to watch, but it is also fun to watch other hens too so this is great! Thanks for the shout-out! At a talk I recently gave, I referred a questioner to your site.